Electro Harmonix Slammi Review - Best Pitch-Shifter/Harmony Effects Pedal? Electro Harmonix Slammi Review – Best Pitch-Shifter/Harmony Effects Pedal? I’m a big fan of pitch-shifting and harmony pedals. For years I ran a pedalboard with at least 3 different pitch-shifting guitar pedals to cover the full range of dive-bombing and whammy-style effects. And ever since I first played the Electro Harmonix POG 2 Polyphonic Octave Generator and was amazed by its stunning polyphonic octave effects, I dreamt of the day when EHX would release a dedicated pitch-shifting pedal. My call was finally answered. At last the Electro Harmonix Slammi Polyphonic Pitch-Shifter/Harmony pedal has arrived. The Slammi is the latest entry in the Next Step line of Electro Harmonix effects pedals. Unlike typical foot-controlled expression pedals, the Slammi uses no moving parts, relying instead on a motion sensor to track the movement of the pedal. The Slammi also features a range of commonly used note intervals with a range extending up 3 octaves and down 3 octaves. There’s also a detune setting for chorus-like effects. The pedal is also half as wide as pedals that produce similar effects. The Slammi seems to have a lot going for it. Is it the best pitch-shifter/harmony effects pedal? You’ll find out in our Electro Harmonix Slammi review. Advanced new algorithm that sounds great and provides glitch-free tracking. Up to three-octave maximum bend. Create harmonies by mixing your dry signal with the effect. MAX BEND Control acts as an 11-way switch to set the maximum bend/interval. Choose Detune, ½ Step, Major 2nd, Major 3rd, Perfect 4th, Perfect 5th, Major 6th, Minor 7th, 1 Octaves, 2 Octaves or 3 Octaves/Dive Bomb. Precision control that lets you smoothly sweep your guitar’s pitch up or down. Sweep direction can be reversed so maximum pitch bend is in the heel-down position. Super responsive design with no moving parts, nothing to wear out or break. Comes with 9 Volt battery, 9.6DC-200BI power supply optional. 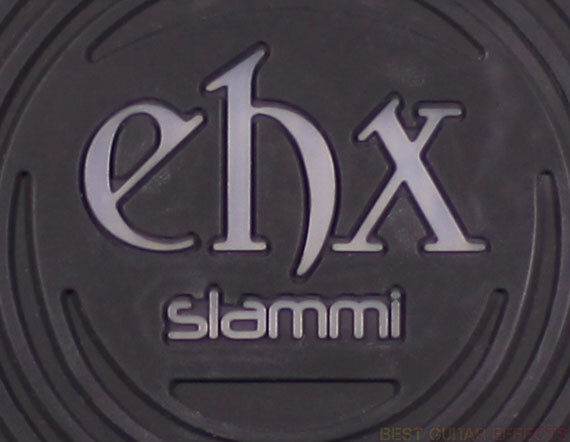 Visit Electro Harmonix for more info about the Slammi. The Slammi is certainly one of the more unique pitch-shifting pedals out there thanks to its interesting design first and foremost. But before I get into that aspect of this pedal, I really have to divulge my thoughts about how this pedal sounds. I’ve played a lot of pitch-shifting pedals over the years, and the Slammi has one of the best-sounding and most glitch-free algorithms I’ve ever heard. If you’ve followed the evolution of pitch-shifting effects over the past few decades, you’ve probably heard plenty of those nasty, unstable artifacts produced by some of the prototypical designs in this category of effects. Not to mention that many of the effects that support polyphonic pitch-shifting still suffer from a noticeable wobbling sound when playing chords. That’s not a problem at all with the Slammi as it sounds absolutely pristine for most uses. Using the Dry Vol to bring in some of your clean, dry signal offers some very unique possibilities for shifting in some harmonies while playing full chords. You could simply set the Slammi to an octave up for 12-string guitar effects, manually shifting up to the octaves if desired. Or you could shift in some 5ths or other interesting sounding note intervals only on certain parts of a chord progression. There’s lots of creative possibilities here. The detune setting provides chorus-like sounds and is a solid effect for thickening up jangly chords although it’s not quite as warm your favorite analog chorus pedal. The polyphonic note tracking is very smooth and works exceptionally well over chords and single notes alike and sounds surprisingly natural compared to some of the lesser pitch-shifting algorithms I’ve heard. There’s no need to switch between different modes for single notes or chords. There’s just one fantastic algorithm for all purposes. It’s also worth noting that the octave effects are on par with the excellent POG 2 Polyphonic Octave Generator, a modern Electro Harmonix classic. Cutting out the dry signal and setting the Max Bend to your interval of choice lets you pull off those classic pitch-shifting effects made famous by guitarists like Tom Morello and Steve Vai among others. Using +1 or +2 octaves with the Slammi set to Bend Up is a great place to start. The effects are smooth whether you’re shifting the pitch up or down. The sounds are especially great when shifting full chords, a hard feat to pull off. At extreme +3 octave settings you might hear a slight stepping through notes if you rock the pedal very quickly, but it’s barely noticeable if at all in most cases. The -2 and -3 octave dive-bombs are fun, too, and offer some really cool ways to start or end a song or pull off your best Eddie Van Halen impression without the need for a whammy bar. The Slammi provides some truly great sounding detune and capo effects, and these might be perhaps the biggest selling points of the pedal for some guitarists. At small note interval settings the Slammi sounds quite authentic compared to your original tone and can be a suitable option for raising or lowering your guitar’s pitch without retuning or switching guitars. I was especially impressed with how the Slammi performed with EHX’s own Metal Muff with Top Boost, retaining plenty of note definition and low-end chunk. Guitarists who like heavy, low-tuned distortion tones will appreciate how the Slammi fares in this arena. The Slammi’s range of movement it steady and smooth throughout with a perfect pivot point and a comfortable throw/sweep range. The pedal has a heavy, solid feel that provides a consistent range of motion like any well-made expression pedal should. Like any other expression controlled effect, with a little practice you’ll be able to control the sweep comfortably. The Next Step Effects, including the Slammi, are a boon for budget conscious guitarists as the lack of moving parts helps keep these pedals very affordable. But this design brings up a few points of concern. It’s a bit challenging to change settings on the fly, so you may find yourself restricted to picking just one setting for a live situation. (I used to perform with 3 different pitch-shifting pedals set to different settings, so that may not be a problem for some.) Also, your pedalboard patch cables will be subjected to a bit of movement when you rock the pedal back and forth, potentially reducing their lifespan. The pedal also tends to move around when you use it, so if you plan on adding this to your pedalboard, consider picking up the EHX Next Step Effects Cradle as well. When you tilt the toe end of the pedal forward to activate/bypass the pedal, there is a slight latency. 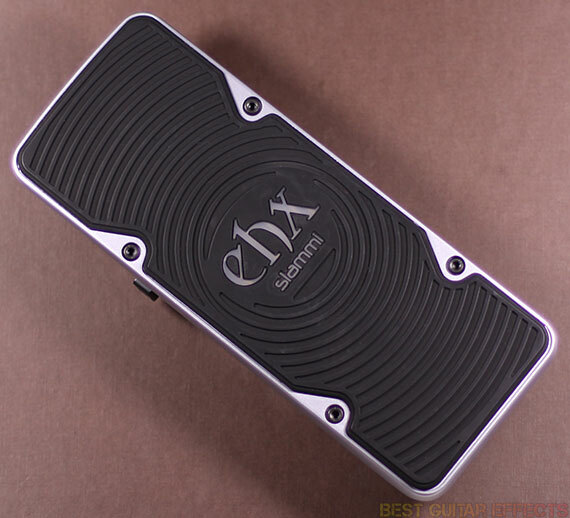 The EHX light will also be covered by your foot, hiding the visual indicator of whether or not you have successfully turned the pedal on or off. Using it in an effects loop router is a solution or external bypassing of the Slammi. So while the Slammi sounds incredible, these few concerns are worth considering. One last thing, I really like that you can easily calibrate the Slammi to operate in either direction of its sweep. This allows you to leave the Slammi laying flat with the pitch changed to make drop-tuning and capo effects easier to use. If you reverse the sweep, leaving the pedal flat will produce your dry signal, while rocking the pedal to the heel position will shift the pitch to the settings you have dialed in. Both options are useful in different situations. For me, it’s all about how good this pedal sounds. The sound quality of the Slammi’s pitch-shifting is very hard to beat, especially for the price. Let’s see the final result. The Electro Harmonix Slammi offers impeccable glitch-free pitch-shifting/harmony effects and is an exceptional value for the price. The unorthodox design of the pedal may not be for everyone, but those who appreciate the high-quality sounds this pedal offers will be in for a real treat. The Slammi can shift single notes and full chords alike without a trace of the nasty artifacts inherent in many lesser pitch-shifting pedals. The biggest strength of this pedal is probably the super high quality polyphonic capoing and drop-tuning effects that sound surprisingly natural. If you’re looking for the best pitch-shifter/harmony pedal and place your greatest focus on sound quality (and saving a buck or two while you’re at it), the Slammi may be the pedal for you. That concludes our Electro Harmonix Slammi review. Thanks for reading. 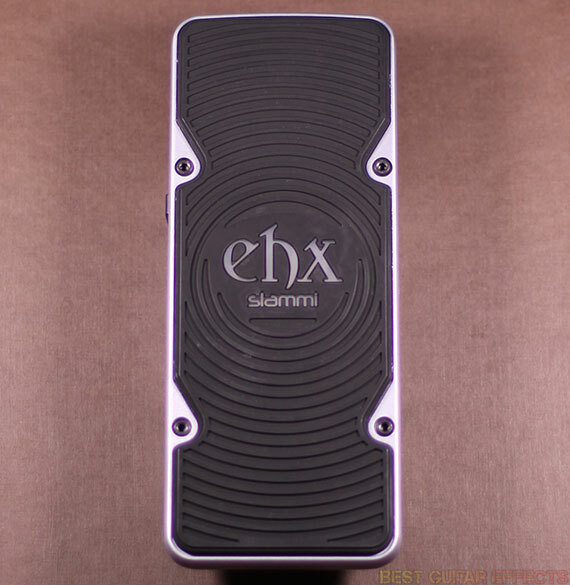 Want to buy the Electro Harmonix Slammi?